Fluorescent H1 histamine receptor antagonist (apparent KD values are 8.07, 5.37 and >6 for H1, H2 and H3 receptors respectively). 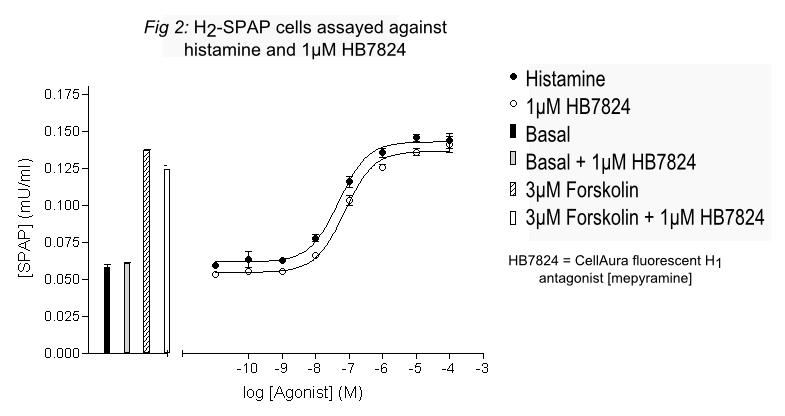 Also antagonizes the activity of Histamine, a H1 histamine receptor agonist. Displays no intrinsic activity. A fluorescent mepyramine analogue. For imaging at the H1 receptor use solutions up to 100 nM. The CellAura fluorescent H1 antagonist [mepyramine] ligand was shown to antagonize the activity of the H1 agonist, histamine, in the recombinant CHO cell line expressing the human H1 receptor, co-transfected with a serum response element-induced secreted placental alkaline phosphatase (SPAP) reporter gene. 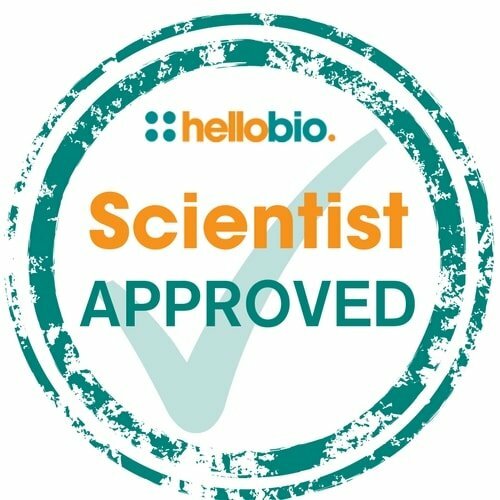 For the H1 expressing cell line, the serum-induced expression of SPAP was measured under basal and 1% serum-stimulated (maximal) conditions. Addition of CellAura fluorescent H1 antagonist [mepyramine] to the basal or serum-stimulated cells did not significantly alter basal and stimulated SPAP levels, demonstrating that CellAura fluorescent H1 antagonist [mepyramine] has no intrinsic agonist activity. 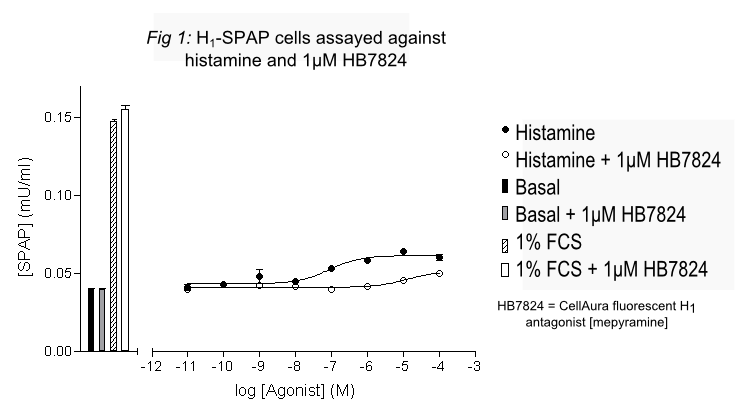 To determine the apparent KD for CellAura fluorescent H1 antagonist [mepyramine] at histamine H1 receptors, cells were treated with varying concentrations of histamine agonist alone, or in the presence of 1µM CellAura fluorescent H1 antagonist [mepyramine], and the serum-induced expression of SPAP measured. The apparent KD at H1 was calculated from the rightward shift of the agonist response curve in the presence of CellAura fluorescent H1 antagonist [mepyramine], compared to the response curve for the agonist alone. Similar studies were conducted with the CellAura fluorescent H1 antagonist [mepyramine] ligand using recombinant CHO cell lines expressing either the human H2 receptor or the human H3 receptor and a cyclic AMP-responsive secreted placental alkaline phosphatase (SPAP) reporter gene. The apparent KD at H2 was calculated in the same way to that calculated for the human H1 receptor.